but that was the norm. People create societies because they want to belong. There’s strength, see, in numbers and a shared opinion that saves you from thinking for yourself. A contact of mine, who fancies himself as a bit of a wag, created the misanthropic society. And he asked me to join. Such an invitation created a distopia of feelings. Whilst its nice to be asked to join a group, no matter how facile the subject matter might be (or, in this case, perhaps how anti-facile since it involves avoiding the majority of the gene pool in acknowledgement of their inadequacies), extending such an openness would be missing the point. And from the very people who are supposed to embrace misanthropia. I clearly cannot join a misanthropic society that has any members. Membership is contact, human contact, and an acceptance of value. I cannot be part of this. 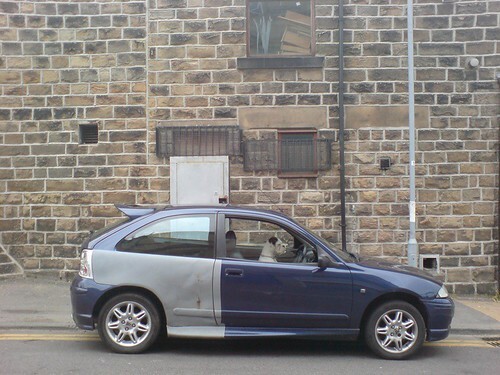 Barnsley driver, originally uploaded by Alex Veitch. In Barnsley, dogs don’t walk.